The 2015 Jeep Patriot continues as the toughest small SUV on the market. If you're on the hunt for an award-winning Jeep in Tyler or Greenville, TX, Sulphur Springs Chrysler Dodge Jeep Ram is happy to take you for a test drive in the model of your choice. The 2015 Jeep Patriot has a few things other small SUVs don't have: Jeep good looks and off-road ability. The 2015 Patriot comes equipped with either a 2.0-liter four-cylinder with 158 horsepower or a 2.4-liter four-cylinder with 172 horsepower, depending on the trim level. Transmission choices range from a five-speed manual to a six-speed automatic, and an efficient CVT. The transmission choices are dictated by your choice of front-wheel or all-wheel drive systems, with the more off-road oriented package requiring the CVT. 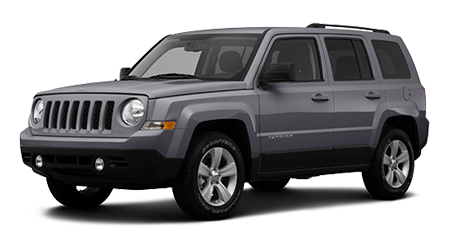 The 2015 Jeep Patriot comes in Sport, Latitude, and Limited trim levels with front-wheel and 4x4 variants for each. The Sport is the most basic trim but includes cruise control, tilt steering, and a four-speaker audio system with auxiliary input and a CD player. An Altitude appearance package adds 17" black alloy wheels and special trim. A Power Value package adds keyless entry and power windows and locks, but first requires the addition of optional AC. Order the Latitude trim and get all that equipment standard plus 17" alloy wheels, heated seats, and reclining 2nd-row seats. A High Altitude package adds unique 17" wheels, six-way power driver seat, leather upholstery, and a sunroof. The Patriot Limited comes with all that, plus the larger 2.4-liter engine, four-wheel disc brakes, and upgraded audio and climate control systems. A la carte option packages are the Sun and Sound group (sunroof and Boston Acoustics nine-speaker audio with subwoofer and tailgate speakers) and the Security and Cargo Convenience group (remote start, Uconnect with voice commands, and universal garage door opener). Optional on all Patriot models is the Freedom Drive I all-wheel drive system. If you plan on doing any serious off-roading with your Patriot, be sure to order the Freedom Drive II group as well, which includes skid plates and off-road tires, plus brings the CVT transmission with low range gearing. If you are shopping around Texas for an SUV and looking for capability without all the bulk, the 2015 Jeep Patriot is the perfect vehicle to have on your list. Tyler, Greenville and Sulphur Springs, TX residents have been buying Jeeps of all sizes at Sulphur Springs CDJR for years - and loving them!